The long-awaited premiere of a powerful new documentary produced by the International Bluegrass Music Museum in Owensboro, KY takes place at 9:00 PM EDST on Tuesday, June 10, 2014 on Kentucky Educational Television. Powerful: Bill Monroe Remembered tells the poignant, riveting story of Ohio County, KY native Bill Monroe, Father of Bluegrass Music, through the remembrances of dozens of his “Blue Grass Boys,” the name given to the 161 sidemen and women who, at various times, were members of his band from the 1940s until his death in 1996. The movie “Powerful”, about Bill Monroe, made its debut right on Bill’s 100th birthday, and it is a truly awesome and amazing piece of work. The meat of the 2-hour film is beautifully shot and edited stories from his stunning cavalcade of sidemen… including Earl Scruggs, Jimmy Martin, Bobby Hicks, Jack Hicks, George Shumate, Peter Rowan, Del McCoury, Byron Berline, Glen Duncan, Bill Keith, James Monroe, Lamar Grier, and on and on. These men were at their ease, very-well recorded, telling it like it was, and the subject matter and editing makes the time just fly by, as a deep and rich portrait emerges of the cross-eyed child who could lift a 1000 pound log, kick a mule in the jaw with “the sound of an exploding watermelon”, scare the devil out of his musicians, and melt your heart with a kind word or act, or soulful song. This movie, by Joe Gray of Louisville, KY, is no less than a masterpiece in my opinion, with very high cinematic values, deeply insightful, and beautifully woven — probably the best movie ever about bluegrass – Pete Wernick. Powerful actually had its genesis as far back as 2003. In September of that year, in a clearly time-dated and historically impactful project, the International Bluegrass Music Museum launched its Video Oral History Project to professionally record the histories of the living members of bluegrass music’s 1st and early 2nd generations. In so doing, the museum created an archive of a vastly under-documented segment of our nation’s cultural heritage by filming in-depth, first person interviews conducted by knowledgeable historians. Many of the interviews were augmented with concert footage. Midway through the Video Oral History Project’s process, it became apparent that the Blue Grass Boys’ remembrances about Bill Monroe had not been captured for posterity and would be lost forever if immediate action was not taken to record their histories. This loss would have been a travesty, since “bluegrass” is one of a scant handful of original American music genres, and as such, is an integral part of the nation’s cultural heritage. The pioneering members of the genre contributed to the shaping of the sound and its popularity in lands far and wide. Their influence on acoustic music in the 20th Century has since led to the establishment of bluegrass communities throughout North America, Japan, Europe, Russia, Australia, and elsewhere. This worldwide bluegrass community is currently estimated in the tens of millions and growing exponentially as the genre opens wide to its roots and branches. The museum therefore set out to create a definitive document that would tell Mr. Monroe’s story in a way in which it had never been told. Powerful: Bill Monroe Remembered, takes the viewer back to the early days of bluegrass music through the stories of those who lived it. What emerges is a powerful and enduring portrait of one of America’s most important musical creators. 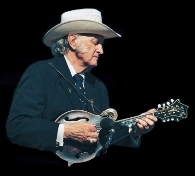 After its premiere on KET, the International Bluegrass Music Museum will show Powerful: Bill Monroe Remembered on each day of its upcoming festival, ROMP, June 25-26-27-28.